Universities and their presses are often thought of as ivory towers secluded and protected from the harsh realities of the world. From A Single Window tells a different story. Based on previously unexamined documents from Michigan State University Press's archives and extensive interviews, this history describes the powerful national forces that shaped both the Press and the University. Anti- communism and anti-intellectualism, the student protest movement and the Vietnam War, inflation and corporate consolidation are examined from the special perspective of Michigan State University's dynamic press. Both a discussion of distinguished press books and a lively reexamination of a forgotten past, this extraordinary work presents new evidence of its parent university's clandestine involvement in the Cold War and it celebrates two previously unrecognized defenders of the First Amendment. 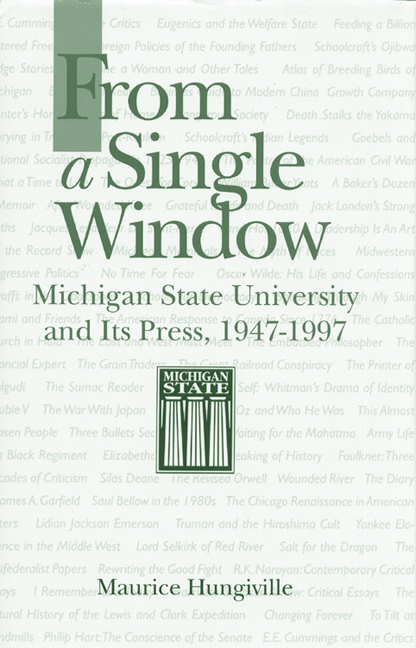 Above all, this is the inside story of how writers, professors, and administrators enabled Michigan State University to build a scholarly press, through which MSU contributes to the ongoing international conversation about public policy, civil rights, history, and literature.